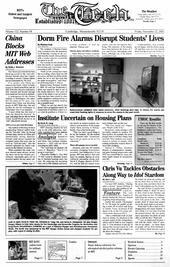 The Chinese government has been blocking access to the “mit.edu” Internet domain since late August, according to several Chinese reports and an examination by The Tech. The results of the Ugliest Manifestation on Campus charity fundraiser were announced to an intimate crowd of approximately ten in Lobby 10 yesterday. The overall winner was the “People Shutting Down Skuffle,” amassing $333.54.